Tag words: tuberculosis, TB, Mycobacterium tuberculosis, M. tuberculosis, Mycobacterium bovis, Mycobacterium leprae, M.TB, MTB, Ziehl-Neelsen, cord factor, mycolic acid, granulomateous, tubercle, Simon foci, Ghon complex, tuberculin, PPD, tuberculin test, Mantoux test, skin test, isoniazid, INH, ethambutol, pyrazinamide, PZA, BCG vaccine, MDR TB, XDR TB. The virulence of Mycobacterium tuberculosis is extraordinarily complicated and multifaceted. Although the organism apparently does not produce any toxins, it possesses a huge repertoire of structural and physiological properties that have been recognized for their contribution to mycobacterial virulence and to pathology of tuberculosis. Some of the general properties of Mycobacterium tuberculosis that render it virulent are discussed below. This section is followed by a more specific discussion of the complex array of virulence determinants exhibited by this pathogen. This should not surprising for one of the most successful human pathogens to have evolved. Some general properties of Mycobacterium tuberculosis that contribute to its virulence. Special mechanisms for cell entry. The tubercle bacillus can bind directly to mannose receptors on macrophages via the cell wall-associated mannosylated glycolipid, LAM, or indirectly via certain complement receptors or Fc receptors. Intracellular growth. MTB can grow intracellularly. This is an effective means of evading the immune system. In particular, antibodies and complement are ineffective. Once MTB is phagocytosed, it can inhibit phagosome-lysosome fusion by secretion of a protein that modifies the phagosome membrane. It may remain in the phagosome or escape from the phagosome, in either case, finding a protected environment for growth in the macrophage. 1. Compounds including glycolipids, sulfatides and LAM down regulate the oxidative cytotoxic mechanism. 2. Macrophage uptake via complement receptors may bypass the activation of a respiratory burst. 3. The oxidative burst may be counteracted by production of catalase and superoxide dismutase enzymes. Antigen 85 complex. This complex is composed of a group of proteins secreted by MTB that are known to bind fibronectin. These proteins may aid in walling off the bacteria from the immune system and may facilitate tubercle formation. Slow generation time. Because of MTB's slow generation time, the immune system may not readily recognize the bacteria or may not be triggered sufficiently to eliminate them. Many other chronic disease are caused by bacteria with slow generation times, for example, slow-growing M. leprae causes leprosy, Treponema pallidum causes syphilis, and Borrelia burgdorferi causes Lyme disease. High lipid concentration in cell wall. This accounts for impermeability and resistance to antimicrobial agents, resistance to killing by acidic and alkaline compounds in both the intracellular and extracellular environment, and resistance to osmotic lysis via complement deposition and attack by lysozyme. Cord factor. Cord factor (trehalose 6, 6' dimycolate) is a glycolipid found in the cell walls of mycobacteria, which causes the cells to grow in serpentine cords. It is primarily associated with virulent strains of MTB. It is known to be toxic to mammalian cells and to be an inhibitor of PMN migration. Its exact role in MTB virulence is unclear, although it has been shown to induce granulomatous reactions identical to those seen in TB. M. tuberculosis virulence is studied both in tissue culture, using macrophages, dendritic cells or pneumocytes, and in animal models, primarily mice. Tissue culture models are easier and more humane to work with and give faster results, but they are limited to studying early stages of infection. Ultimately, only in animal models can all the stages of TB be studied. Since sequencing the Mycobacterium tuberculosis genome in 1998, genetic methods are more commonly used to study the bacterium's virulence. The usual genetic approaches to study virulence are to disrupt, inactivate, modify, delete or complement a gene and assess the effects in the macrophage or mouse model. In an exhaustive and comprehensive review of possible virulence determinants of Mycobacterium tuberculosis, Issar Smith (Clinical Microbiology Reviews. Vol. 16, No. 3, p 463-496. 2003) identified four culture filtrate enzymes, eleven cell surface proteins, four groups of enzymes involved in cellular metabolism (including lipid metabolism, amino acid and purine biosynthesis, metal uptake, anaerobic respiration and oxidative stress) and three sets of transcriptional regulators to which some degree of the organism's virulence might be attributed. Of approximately 4,000 genes in the Mycobacterium tuberculosis genome, 525 are involved in cell wall and "cell processes", 188 genes encode regulatory proteins, and 91 genes are involved in "virulence, detoxification and adaptation". Over 200 genes are identified as encoding enzymes for the metabolism of fatty acids. This large number of M. tuberculosis enzymes that putatively use fatty acids may be related to the ability of the pathogen to grow in the tissues of the infected host, where fatty acids may be the major carbon source. This is thought to be an important aspect of M. tuberculosis physiology during infection. The point is that these genes, as well as those from other classes, may be directly or indirectly involved in virulence. Some of these genes and their products or activities are described below. 19-kDa protein. The 19-kDa protein is a secreted antigenic protein that is immunologically recognized by T cells and sera from TB patients. When M. tuberculosis enters macrophages and other phagocytic cells, this surface-exposed glyco-lipoprotein is thought to cause host signaling events as it interacts with its receptor, TLR2. There is suggestive but inconclusive evidence that mutant strains of Mycobacterium tuberculosis deficient in production of the 19-kDa protein are rapidly cleared from the lungs and spleen of infected mice. Adding back the wild-type M. tuberculosis gene to these strains allowed growth in lungs that was similar to the growth of standard wild-type strains, which suggested that the 19-kDa protein is essential for virulence. It has been reported that addition of the purified 19-kDa protein to human macrophages causes upregulation of the Th1 cytokine IL-12. Similarly, the 19-kDa protein can activate human neutrophils. Glutamine synthase. The enzyme is not secreted into culture filtrates during growth but results from cell leakage and lysis. glnA1 mutations have not been made in M. tuberculosis, but the specific glutamine synthase inhibitor, L-methionine-SR-sulfoximine (MSO), inhibits the growth of Mycobacterium tuberculosis in vitro and in macrophages but has no effect on nonpathogenic mycobacteria. In addition to its essential role in nitrogen metabolism, glutamine synthase is involved in the synthesis of a poly-L-glutamate-glutamine cell wall component found in pathogenic mycobacteria. These findings have led to the suggestion that this enzyme is a possible target for the development of new drugs which have less toxicity than MSO for humans. Erp. Erp is a surface-located protein secreted by M. tuberculosis. The protein is similar to an exported 28kDa antigen (the PLGTS antigen) in M. leprae and is not found in nonpathogenic mycobacteria. Its function in virulence is unknown. Mas. Mas encodes mycocerosic aid synthase, an enzyme that catalyzes the synthesis of long-chain, multiply methylated branched fatty acids, called mycocerosic acids, that are found only in pathogenic mycobacteria. FbpA. Mycobacteria have three mycolyl-transferase enzymes, encoded by three genes, fbpA, fbpB, and fbpC, that transfer long-chain mycolic acids to trehalose derivatives. The proteins can also bind the cell matrix protein fibronectin. The Fbp proteins are also found in the culture filtrate and are known as the antigen 85A, 85B, and 85C complex (Antigen 85 complex). The three fbp genes have been separately inactivated, but only the M. tuberculosis fbpA mutant showed severely attenuated growth in human and murine macrophages. The observation that these proteins produce a formidable immunologic response led to the creation of a new live vaccine that was made by introducing the M. tuberculosis fbpB gene into M. bovis BCG. This recombinant strain shows better protection against virulent M. tuberculosis infection than does the parent BCG strain in a guinea pig model. OmpA. OmpA is a porin-like protein that can form pores in liposomes, a general property of porin family proteins. ompA expression is induced by low pH, as well as by engulfment into macrophages. An ompA mutant demonstrated the following phenotypes: although it showed delayed growth at acid pH, it ultimately grew at wild-type levels; it could not take up small molecules like serine at low pH; it showed reduced ability to grow in both human and murine macrophages. This suggested that the environment encountered by M. tuberculosis during infection is acidic, and that OmpA played a role in the bacterial response to this condition. HbhA. HbhA is a heparin-binding hemagglutin protein that is localized on the surface of virulent mycobacteria. hbhA mutants exhibited wild-type ability to be phagocytosed by and to grow in murine or human macrophages. They are taken up poorly by pneumocytic cells, although the bacterial generation time was normal intracellularly. The mutant grew normally in the lungs of infected mice but had a longer generation time and reached a lower bacterial load in spleens compared to the wild-type. The properties of this mutant indicate that HbhA is important for M. tuberculosis interaction with pneumocytes and that this interaction may play a role in extrapulmonary dissemination. LAM. LAM is a complex glycolipid that contains repeating arabinose-mannose disaccharide subunits. It is a major component of the M. tuberculosis cell wall. It is known to be an immunomodulator analogous to the 19-kDa protein. Addition of LAM to murine macrophages depresses IFN-gamma production. LAM can also scavenge oxygen radicals, in vitro, and inhibits the host protein kinase C. It has been suggested that LAM functions to downregulate host immune responses to M. tuberculosis infection, to protect the bacterium from potentially lethal mechanisms like the respiratory burst. MbtB. The mbt operon, consisting of mbtA through mbtJ, encodes enzymes whose function is to synthesize mycobactin and carboxymycobactin, the major siderophores produced by M. tuberculosis. The operon is part of a regulon that is repressed in high iron conditions. MbtB is an enzyme that catalyzes an essential step in mycobactin synthesis. Like many other bacterial pathogens, during infection, Mycobacterium tuberculosis requires an iron acquisition system consisting of siderophores, to obtain iron from host iron-containing proteins such as transferrin and lactoferrin. Iron is essential for growth of the bacteria and so the element must be extracted from protein-bound iron in the host or from largely insoluble ferric salts in the environment. Iron uptake systems are required to mobilize these forms of iron for transport into the cell. In bacteria, siderophores usually perform this chelation and solubilization function, and the iron they carry is taken into cells by high-affinity iron transport systems. When the mbtB gene of M. tuberculosis is inactivated the resulting mutant strain is unable to synthesize the two mycobactin-derived siderophores. The mutant showed wild-type growth in iron-rich media, but grew poorly when iron is limited. It also grew more slowly than the wild type in human macrophages indicating that the phagosome containing mycobacteria may be low in iron. Furthermore, excess iron exacerbates the progression of TB in humans and animal models. These observations suggest that iron availability, made possible through the activities of siderophores, promotes the growth and virulence of the M. tuberculosis. Oxidative stress proteins. Most aerobic organisms have enzymes that degrade peroxides and superoxide, which are normal byproducts of aerobic respiration, but also are toxic oxygen radicals. These enzymes, generally superoxide dismutases, catalases and peroxidases, are also important for the response to various external oxidative stresses. Since phagocytic cells produce oxygen radicals during the respiratory burst to kill invading bacteria, it is not surprising that these enzymes may contribute to M. tuberculosis virulence. Enzymes found in M. tuberculosis that combat oxygen radicals include AhpC, an alkyl hydroperoxide reductase that detoxifies organic hydroxyperoxides, and SodA and SodC, two species of superoxide dismutase that degrade superoxides, which are normal by-products of aerobic respiration and are also produced by the phagocytic respiratory burst. Nitrate reductase. . M. tuberculosis was originally thought to be an obligate aerobe, but there are numerous experimental indicators that the bacterium can grow in microareophilic environments, especially during the later stages of infection, e.g., in lung granulomas. Wild type M. tuberculosis has been shown to possess an inducible nitrate reductase (NarG encoded by narG) which allows respiration using NO3 as a final electron acceptor. If anaerobic or microareophilic growth is an important feature of M. tuberculosis physiology during infection, the existence of nitrate reductase could be a significant factor in sustaining growth under these conditions. The specific bacterial adhesins involved in the complex interaction between M. tuberculosis and the human host are largely unknown. Nevertheless, a few potential adherence factors have been considered, including the heparin-binding hemagglutin (HbhA), a fibronectin-binding protein, and a polymorphic acidic, glycine-rich protein, called PE-PGRS. HbhA is a surface-exposed protein that is involved in binding Mycobacterium tuberculosis to epithelial cells but not to phagocytes. It could be involved in extrapulmonary spread after the initial long-term colonization of the host. Fibronectin-binding proteins (FbpA), first identified as the α-antigen (Antigen 85 complex), can bind to the extracellular matrix protein fibronectin in vitro. This property may represent a mechanism of tissue colonization. The surface-exposed PE-PGRS proteins found in M. tuberculosis and Mycobacterium bovis also show fibronectin-binding properties. It has been shown recently that Mycobacterium tuberculosis produces pili during human infection, which could be involved in initial colonization of the host (Alteri et al., Proc Natl Acad Sci U S A. 2007 March 20; 104(12): 5145–5150). On the basis of electron microscopic evidence, M. tuberculosis produces a dense fibrillar meshwork composed of thin coiled, aggregated fibers resembling pili that extend many microns away from the bacterial surface. These structures have been named Mycobacterium tuberculosis pili or MTP. Additionally, biochemical and genetic data demonstrate that M. tuberculosis produces pili, whose pilin subunit is encoded by the Rv3312A gene. The serum of tuberculosis patients with active TB has been shown to contain IgG antibodies to MTP, which suggests that the structures are produced in vivo during human infection. Furthermore, isolated MTP bind to the extracellular matrix protein laminin in vitro, suggesting that they act as an adhesin and may be an important host colonization factor of M. tuberculosis. Because MTP are produced in vivo, and the M. tuberculosis habitat is the human body from which it is transmitted directly from person to person, it is likely that pili play an important role in some aspect of human TB infection. If MTP are proven essential for M. tuberculosis to establish infection, as in certain other microbes, then the purified MTP could be considered as a vaccine candidate. The diagnosis of tuberculosis requires detection of acid-fast bacilli in sputum via the Ziehl-Neelsen method as previously described. The organisms must then be cultured from sputum. First, the sputum sample is treated with NaOH. This kills other contaminating bacteria but does not kill the MTB present because cells are resistant to alkaline compounds by virtue of their lipid layer. The media used for growth of MTB and the the resulting colony morphology have been described previously. However, methods of culturing can take 4-6 weeks to yield visible colonies. As a result, another method is commonly used call the BACTEC System. The media used in the BACTEC system contains radio-labeled palmitate as the sole carbon source. As MTB multiplies, it breaks down the palmitate and liberates radio-labeled CO2. Using the BACTEC system, MTB growth can be detected in 9-16 days vs 4-6 weeks using conventional media. Skin Testing is performed as the tuberculin or Mantoux test. PPD (purified protein derivative) is employed as the test antigen in the Mantoux test. PPD is generated by boiling a culture of MTB, specifically Old Tuberculin (OT). 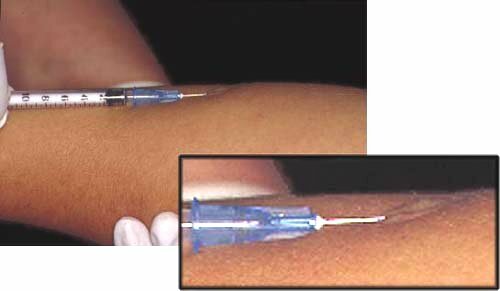 5 TU (tuberculin units), which equals 0.000lmg of PPD, in a 0.1 ml volume is intracutaneously injected in the forearm. The test is read within 48-72 hours. Administering the Mantoux test. CDC. The test is considered positive if the diameter of the resulting lesion is 10 mm or greater. The lesion is characterized by erythema (redness) and swelling and induration (raised and hard). 90% of people that have a lesion of 10 mm or greater are currently infected with MTB or have been previously exposed to MTB. 100% of people that have a lesion of 15 mm or greater are currently infected with MTB or have been previously exposed to MTB. False positive tests usually manifest themselves as lesser reactions. These lesser reactions could indicate prior exposure or infection with other mycobacteria or vaccination with BCG. However, in places were the vaccine is not used, lesser reactions should be regarded as highly suspicious. False negatives are more rare than false positives but are especially common in AIDS patients as they have an impaired CMI response. Other conditions such as malnutrition, steroids, etc., can rarely result in a false negative reaction. Because administration of a single drug often leads to the development of a bacterial population resistant to that drug, effective regimens for the treatment of TB must contain multiple drugs to which the organisms are susceptible. When two or more drugs are used simultaneously, each helps prevent the emergence of tubercle bacilli resistant to the others. However, when the in vitro susceptibility of a patient's isolate is not known, which is generally the case at the beginning of therapy, selecting two agents to which the patient's isolate is likely to be susceptible can be difficult, and improper selection of drugs may subsequently result in the development of additional drug-resistant organisms. Hence, tuberculosis is usually treated with four different antimicrobial agents The course of drug therapy usually lasts from 6-9 months. The most commonly used drugs are rifampin (RIF) isoniazid (INH), pyrazinamide (PZA ) and ethambutol (EMB) or streptomycin (SM). When adherence with the regimen is assured, this four-drug regimen is highly effective. Based on the prevalence and characteristics of drug-resistant organisms, at least 95% of patients will receive an adequate regimen (at least two drugs to which their organisms are susceptible) if this four-drug regimen is used at the beginning of therapy. Furthermore, a patient who is treated with the four-drug regimen, but who defaults therapy, is more likely to be cured and not relapse when compared with a patient treated for the same length of time with a three-drug regimen. Drugs used to treat TB disease. From left to right isoniazid, rifampin, pyrazinamide, and ethambutol. Streptomycin (not shown) is given by injection. CDC. A vaccine against MTB is available. It is called BCG (Bacillus of Calmette and Guerin, named after the two Frenchmen that developed it). BCG consists of a live attenuated strain derived from Mycobacterium bovis. This strain of Mycobacterium has remained avirulent for over 60 years. The vaccine is not 100% effective. Studies suggest a 60-80% effective rate in children. ï¿½ The vaccine cannot circumvent disease reactivation in previously exposed individuals. ï¿½ The vaccine does not prevent infection, only disease. Therefore, the entire population would have to be vaccinated if the vaccine was to be considered efficacious. ï¿½ Vaccination may complicate the way the tuberculin skin test is read in this country. In places that do not vaccinate, the skin test may be used to monitor the effectiveness of antibiotic therapy. Multidrug-resistant tuberculosis (MDR TB) is TB that is resistant to at least two of the best anti-TB drugs, isoniazid and rifampicin. 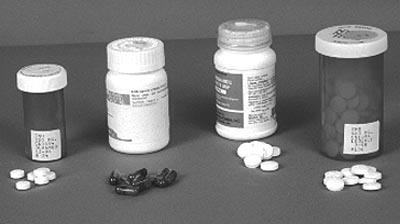 These drugs are considered first-line drugs and are used to treat all persons with TB disease. Extensively drug resistant TB (XDR TB) is a relatively rare type of MDR TB. XDR TB is defined as TB which is resistant to isoniazid and rifampin, plus resistant to any fluoroquinolone and at least one of three injectable second-line drugs (i.e., amikacin, kanamycin, or capreomycin). Because XDR TB is resistant to first-line and second-line drugs, patients are left with less effective treatment options, and cases often have worse treatment outcomes. Both MDR TB and XDR TB are more common in TB patients that do not take their medicines regularly or as prescribed, or who experience reactivation of TB disease after having taken TB medicine in the past. Persons with HIV infection or other conditions that can compromise the immune system are at highest risk for MDR TB and XDR TB. They are more likely to develop TB disease once infected and have a higher risk of death from disease. The risk of acquiring XDR TB in the United States appears to be relatively low. However, it is important to acknowledge the ease at which TB can spread. But long as XDR TB exists, the U.S. is at some risk. The risk of acquiring MDR TB in the United States is < 0.7% in U.S.-born persons but higher in foreign-born persons. Since 1998, the percentage of U.S.-born patients with MDR TB has remained fairly constant. However, of the total number of reported primary MDR TB cases, the proportion occurring in foreign-born persons increased from 25% (103 of 407) in 1993 to 80% (73 of 91) in 2006. The Centers for Disease Control (CDC) Division of Tuberculosis Elimination advises how to prevent or minimize the development of MDR strains of M. tuberculosis. ï¿½ The most important thing a patient can do is to take all of their medications exactly as prescribed by a health care provider. No doses should be missed and treatment should not be stopped early. Patients should tell their health care provider if they are having trouble taking the medications. If patients plan to travel, they should talk to their health care providers and make sure they have enough medicine to last while away. ï¿½ Health care providers can help prevent MDR TB by quickly diagnosing cases, following recommended treatment guidelines, monitoring patientsï¿½ response to treatment, and making sure therapy is completed. ï¿½ Another way to prevent getting MDR TB is to avoid exposure to known MDR TB patients in closed or crowded places such as hospitals, prisons, or homeless shelters. persons who work in hospitals or health-care settings where TB patients are likely to be seen should consult infection control or occupational health experts. Ask about administrative and environmental procedures for preventing exposure to TB. Once those procedures are implemented, additional measures could include using personal respiratory protective devices. In February 2008, the World Health Organization released its fourth global report on anti-TB drug resistance, which indicated that the number of MDR TB cases worldwide was the highest ever reported (489,139 cases in 2006) and that XDR TB had been reported in 45 countries. A critical need exists for new drugs and new drug regimens to address this growing challenge.